London: The global credit crisis and the collapse of Lehman Brothers Holdings Inc. have punished all manner of hedge funds. But in London, where a number of them have already been closed, the retreat has a particular resonance. Along with celebrity chefs, Russian oligarchs and Italian soccer coaches, hedge funds that established operations here in the last decade have been viewed as a mark of London’s new hip spirit of decadent cool—a notion reinforced by the British pound’s long period of strength and a housing boom. Now, the failure of Lehman Brothers, which had deep relationships with some of the largest hedge funds in the world, has unsettled an already jittery market, inciting fears that some hedge fund assets might be frozen here and thus would be unavailable for sale if investors want to redeem them. For GLG Partners Lp., the largest and most scrutinized hedge fund in London—whose founding partners were originally backed by Lehman—the uncertainty added to broader concerns. Its funds are down 11%, on average, through August, albeit in a very difficult market. And at least $4 billion (Rs18,680 crore) is expected to depart this November when its most recognized and successful trader, Greg Coffey, leaves to start a fund. In a statement, GLG said it had removed the bulk of its assets from Lehman last week and that any remaining exposure was not material. None of that, however, dissipates the darkening mood that has taken root within the hedge fund industry here, one that is felt most acutely in the London enclave of Mayfair where GLG and most other funds are based. 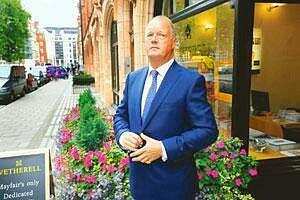 “The bling is gone," said Peter Wetherell, a prominent real estate agent in Mayfair, whose client list includes hedge fund executives, Arab sheiks and others in search of a Mayfair mansion. With his bonhomie, deep tan and a chunky silver watch that hangs heavy on his wrist, Wetherell seems to be a fading emblem of a more exuberant time. Standing outside his office, just opposite Scott’s, the fashionable restaurant and nightclub, he shakes his head. “It’s tough out there and the streets are quieter now," he said. “You will see people being less ostentatious about their wealth—but it hasn’t been a bad party, has it?" In Mayfair, the first signs of what many say could be a debilitating hangover are already evident. According to Wetherell, the number of deals he has handled so far this year is down sharply—48, compared with 136 a year earlier. And during the usually busy lunch hour, many of the shops on Mount Street—from the Porsche dealership where £112,000 (Rs95 lakh) Turbo Carreras are for sale to a tobacconist selling £47 Havana cigars—were empty. The list of hedge fund implosions in 2008 is growing here. It began with the precipitous fall of Peloton Partners Llp. this spring and has included others such as Pentagon Capital Management Plc. More recently, the troubles have extended to funds caught short when commodity prices began to plummet, including RAB Capital Plc. and Red Kite Capital. “There are more funds in forced liquidation than at any time I have seen in the last 10 years," said Christopher Keen, a partner at Culross Global Management Ltd, which manages a portfolio of outside hedge funds for investors. But it is the condition of GLG, which manages $23 billion and will celebrate the first anniversary of its listing on the New York Stock Exchange in November, that symbolizes both the headiness and the vulnerability of the hedge fund boom in London. Founded by a group of former Goldman Sachs Group Inc. private-client executives in 1995, GLG—the name composed of the first letter of the last name of the three founding partners, Noam Gottesman, Pierre Lagrange and Jonathan Green—became a meritocratic melting pot by attracting aggressive, foreign-born traders and giving them room to run. Their extraordinary asset growth swung the pendulum of influence from The City, as the financial district is known, and the traditional banking and insurance company arbiters of financial power to the hedge fund centre in Mayfair. As their returns soared, so did their swagger. The London media paid close attention to the £150 million paydays of the leading fund operators, their grand houses and their country mansions. In 2006, GLG’s founding partners forced out one of their most profitable traders, Philippe Jabre, a Lebanese native, after his trading practices became the target of a regulatory investigation. That they are now losing a second trader, Coffey, an emerging market expert from Australia who left $250 million in his pay on the table to start his own firm, has raised questions within London’s hedge fund industry about their ability to retain talented traders. Worries were only compounded after Lehman’s collapse as investors tried to determine GLG’s exposure. The crux of the issue is that Lehman, as a dominant provider of both complex derivative assets to funds and a prominent insurer of credit default swaps, was an essential conduit for hedge funds investing in these esoteric areas. To the extent that such assets remain at Lehman, in the hands of administrators, large funds will have trouble gaining access to them in the event that investors choose to take out their money. Lehman has an 11% stake in GLG. GLG’s announcement that it had been pulling its funds from Lehman for months will comfort investors and counters a view held by some that the doors closed before all money could be transferred. The Barclays Plc. purchase of Lehman’s brokerage system should also ease investor concerns, but it does not ensure immediate access to funds. In a presentation at a Lehman conference this month, Gottesman, GLG’s co-chief executive, argued that the firm—with its diversified line-up of funds—was well placed to survive the volatile markets. He added that GLG’s recent performance had been affected by a plunge in returns from Coffey’s main fund and that suitable replacements have already been hired to succeed him—including a top proprietary trader from Goldman Sachs, two seniormanagers from Morgan Stanley and an executive from bond firm Pacific Investment Management Co.